In mid-June and into July, the appearance of daisies begins the parade of favorite field wildflowers in dry fields and on sunny roadsides. Daisies are just the first, to be followed by yarrow, black-eyed Susans, and Queen Anne’s lace as summer progresses. The late-spring display of ox-eye daisies (Leucanthemum vulgare, Chrysanthemum leucanthemum) and other field wildflowers is a reminder, or some might say a left-over, from a time when New England’s landscape was a patchwork of open fields and pastures. Back then, the old stone walls that we now find in the woods bordered open fields and pastures. Our classic daisies, the ox-eye daisies, are not native. They arrived here from Eurasia in the very early days of European settlement. One early importer was John Winthrop, jr., son of the first governor of the Massachusetts Bay Colony. In 1631 he brought with him daisy seeds he’d purchased in London. One common name for the plant back then was maudlin, or maudlin daisy, after Mary Magdalen of the Bible. People also inadvertently brought in daisy seeds, mixed with crop seeds or hay and in the ballast dumped here by ships after crossing the Atlantic. With a history going back to the Greeks and Romans, it’s no surprise that ox-eye daisy has been used as food and medicine. These days some people who like to forage for wild foods enjoy using the tender young, unopened leaves and buds in their wild spring salads. In old folk medicine in Europe, a tea from ox-eye daisies was used to treat coughs from asthma and whooping cough. Once the plant arrived on this continent, American Indians made a tea from it for fever and an external wash for chapped skin, bruises, and wounds. Another old-time use of ox-eye daisy was as an insect repellent. The plant contains pyrethrum, which helps to discourage some insects from feeding on it. These days some people who fish or hike rub crushed daisy flowerheads into their clothing to help keep away mosquitoes, black flies, and deer flies, without the artificial scent of commercial insect repellents. Ox-eye daisies are a great example of an extremely successful flower structure. Each 1-2- inch wide daisy blossom is really a flowerhead containing a large number of smaller, individual flowers that serve both the plant and visiting insects well. The 20-30 white “petals” are actually sterile female flowers that act as flags and landing pads for insects. The yellow center contains hundreds of tiny tube-shaped flowers with both pollen-bearing parts (which ripen first) and pollen-receiving parts (which ripen last). This arrangement allows bees and other pollinators to do some efficient one-stop shopping as they gather nectar from many flowers during a single visit. In the process, pollen sticks to the insects, and pollen from previously visited daisy flowerheads brushes off. 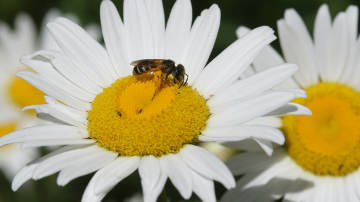 This transfer of pollen provides a healthy cross-pollination among daisy plants. Our springtime ox-eye daisies are hard to forget, but throughout the growing season you might notice other flowers that prompt you to think “daisy.” In spring or early summer, you’re likely to notice native fleabanes (Erigon). Once believed to keep away fleas, these plants have small daisy-like flowerheads (1/2- to 1-inch) with a large number of thin white petals – almost too many to count. Another plant, called lawn daisy or European daisy (Bellis perennis), is a non-native plant (from Europe) that tends to grow in lawns. The name “daisy” comes from this plant, originally known as “days-eye” because its blossoms close at night. (Ox-eye daisies stay open at night.) In late summer or fall, you’ll probably see different kinds of white asters with small daisy-like flowerheads. Look for ox-eye daisies from mid-June through July, and then enjoy the other field wildflowers that take their place.